After 35 years of throwing hundreds of events, we’ve answered countless questions about casino parties. One of the most common questions our event planners get is what people should wear (or not wear) to a casino party or fundraiser. The answer to that question all depends on what type of casino party you’re throwing. Below are some of the most popular casino party themes and appropriate apparel for each occasion. We throw corporate casino parties on a regular basis and most of them have a similar dress code. The attire typically ranges from business to business casual clothing. Basically what you’d wear on casual Friday is acceptable, but if you want to go a little dressier than you would in the office that’s fine too. It’s okay to unbutton your collar, just remember to keep it professional. Another consideration is whether there will be guests from outside the office attending. When clients, vendors and partners are invited to the corporate casino party then the attire is usually a little more buttoned up. That way people have fun but it stays somewhat professional. 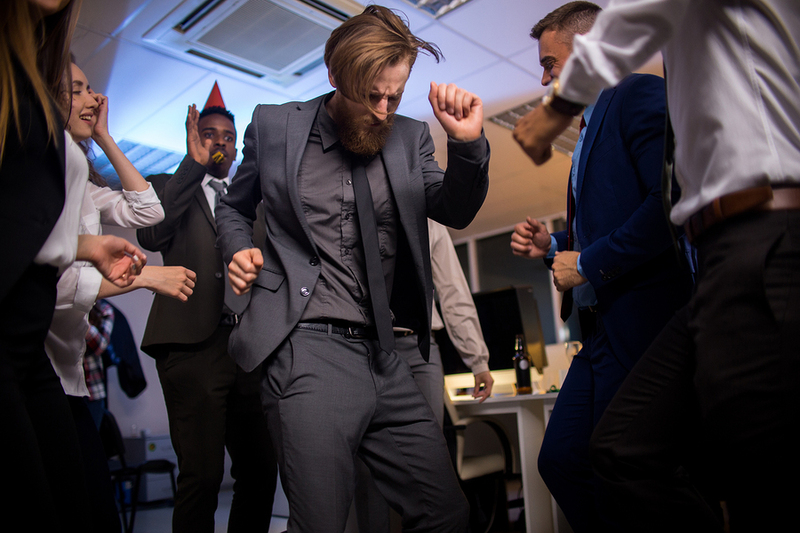 Whatever dress code you want to go with at a corporate casino party, the organizer should send out an email or notice to all employees letting them know what to wear. Casino themes are very popular for fundraisers since it gets people energized and in the spending spirit. With a Casino Knights Inc. casino night fundraiser you’ll raise a ton because guests aren’t gambling with their own money. It’s all strictly for fun so even if guests lose they still have plenty to donate. At a black tie fundraiser you can go all out dressing to the nines. The attire is going to be very formal for men and women. Men should plan on wearing a tuxedo or a nice suit. If ever there was a time to bust out a three-piece suit this is it. Women will mostly be wearing cocktail dresses and floor length gowns. 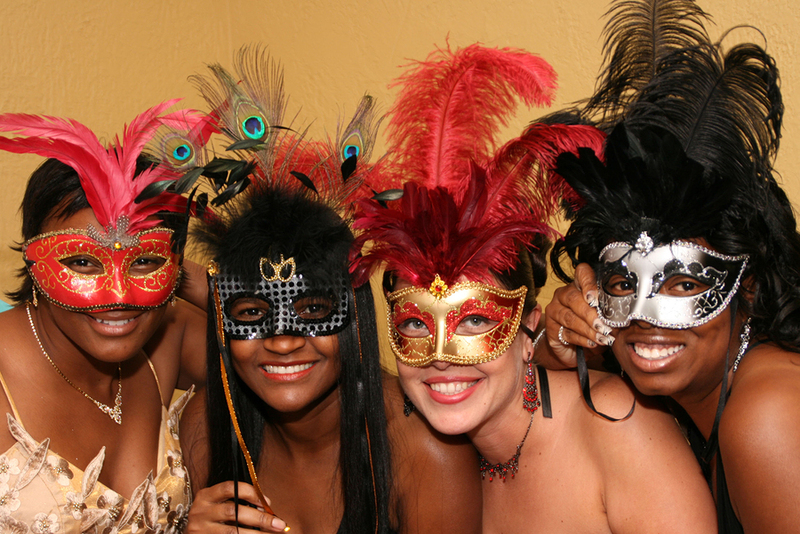 Some black tie casino parties have a theme that can influence the attire. For example, if you do a roaring twenties theme that should inspire the ensembles to have flapper flair. Just like a corporate casino party, if there’s going to be a theme that the guests should dress for let people know in advance. Mardi Gras is one of the most festive events in the world. Every February people lose their inhibitions and allow themselves to cut loose. That’s why it’s the perfect atmosphere for a casino party. We throw Mardi Gras themed parties every year, and they’re always entertaining when it comes to what guests wear. Of course, beads are the ultimate accessory for a Mardi Gras themed event. If you’re the one throwing the event beads make great party favors. Another popular accessory is decorative Mardi Gras masks. Guests can also have fun with outfits that incorporate the traditional green and purple color scheme. Monte Carlo is world famous for its swanky casinos. The coastal city in South France had humble beginnings when the first casinos opened in the 1850s, but that quickly changed as royalty, dignitaries and the wealthy came to play. Years later the James Bond movies have helped the opulent principality become synonymous with high rollers. When someone is throwing a casino party Monte Carlo is one of the first things that come to mind. If high-class is what you’re going for this theme won’t disappoint. The garb for a Monte Carlo theme casino party is similar to black tie but with a touch more glamour. Think tailored suits with shiny cufflinks and sparkling gowns paired with head-turning jewelry. There’s literally no way to be overdressed for a Monte Carlo casino party. One of the most fun casino party themes to dress up for is Queen of Hearts. The Alice in Wonderland character led a legion of playing cards at her beck and call, making it a great idea for a casino party with poker or black jack as the centerpiece. Guests can dress in red or dress up like characters from the story. Around Halloween time this is a popular theme that guests really get into. In general, it’s best to leave the everyday casual clothes in your closet if you’re going to a casino party. Casino parties tend to be nice occasions. The host has spent a fair amount of time and energy putting the event together, so guests should dress accordingly. Ultimately, what to wear (or not wear) to a casino party largely depends on the type of event you attend. It can range from business attire to elaborate costumes to dressy garb you’d see on a red carpet. The theme will give you a clue as to what’s appropriate to wear, but if there’s any doubt you can always reach out to the host for clarification. Want to throw a casino party in Central Texas? Casino Knights Inc. can help you turn an everyday venue into an authentic casino that fits any theme you dream up. Give us a call today to learn more about our casino party packages!